Say you’ve been invited to a dinner party. Being the polite, caring person that you are you asked, “What can I bring?” “Oh, nothing,” replies your host. “Just your sparkling personality.” While you do indeed have a sparkling and engaging personality, you know that’s not going to be enough. You need to bring a bottle of wine. But you’re not about to bring over a Chateau-Neuf-du-Pape or some cult California Pinot Noir (we'll get to those later). You’re going to bring something reasonable but also tasty. Suggestion? Why, thank you for asking. May I recommend a Carménère? Medium-bodied and round with dark berry fruit and a tiny kick of spice on the end, Carménère is a great value wine. It’s not hard to find a quality bottle for under $15, but that’s not what you want to tell your hosts when you plonk down the bottle. If you can’t impress them with a label or a year, then impress them with a story. There’s a reason you may not have seen Carménère until fairly recently – everyone thought it was Merlot. Back when the Romans ruled the Western world they began to cultivate grapes in what would later come to be known as France. The varietal they cultivated was known as Biturica, which, though it's no longer around, gave way to the noble Bordeaux varietals: Merlot, Cabernet Sauvignon, Cabernet Franc and also a little grape called Carménère. 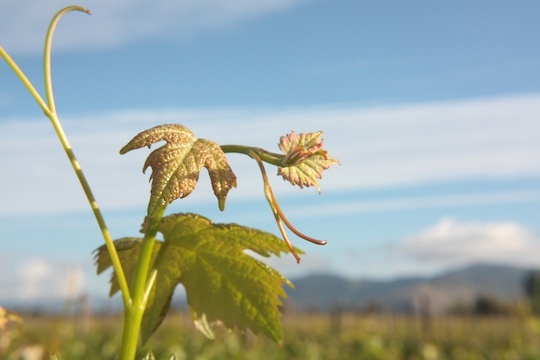 Grapes continued to flourish in Bordeaux until the fateful year of 1870 when a deadly aphid-like pest called Phylloxera attacked Europe’s vines, which is in itself an entirely different story for another day (this will ensure that you get invited back for another dinner). When Bordeaux began replanting its ravished vines, growers downsized their varietals and gave Carménère the boot because it was a weak and unreliable crop. But all was not lost for the plucky Carménère. During the 19th century Carménère clippings were imported into Northern Italy and Chile, though no one knew what they were when they arrived. The Italians mistook it for Cabernet Franc; the Chileans deemed it to be Merlot. There, in Chile, it grew up like Oedipus – lost royalty whose birthright is noble but whose upbringing is that of a peasant. Though – spoiler alert – Carménère did not go on to fornicate with its ancestors, nor has it blinded itself as far as I know. It has a much happier ending and little to no complexes. Until the mid-nineties, Carménère, mistaken for Merlot, was mixed in with the Merlot vineyards. It was blended into the wines, which is what gave Chilean Merlot such a unique and not entirely Merlot-y taste. It sold decently. But no one was going crazy for the stuff. But then, one day in 1994 Professor Jean-Michel Boursiquot from the Montpellier School of Oenology inspected a young vine and confirmed suspicions that it was not Merlot but in fact the all but long lost Carménère. If you’re ever put in the position of having distinguish between the two varietals just look at the leaves. 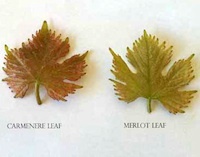 Youthful Carménère leaves have a reddish underbelly while Merlot’s leaves tend to be whiter. Since then, Carménère has gone on to become to Chile what Malbec is to Argentina. Finally elevated to its rightful throne and now to your host’s table. 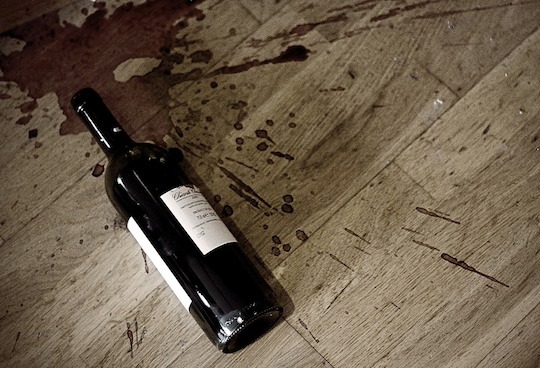 This is one of my husband's favourite stories to tell about wine. He has such a soft spot for Carménère! Nice post! A head's up on the spelling though. It has undergone a number of transformations from the original French Carménère, which confuses everyone (except the French, I suppose), so a number of years ago most Chilean producers and writers started using Carmenère, which still doesn't do much to alleviate confusion, and now, Wines of Chile has taken the official stance that the best solution is to drop all the accents and simply write: Carmenere. The pronunciation, by the way, is "car-men-NAIR." Thanks for the nudge in our direction!